First and foremost our main service is driving you to where you need to go in a safe and courteous manner. A taxi drivers job is more than driving. We help with groceries, we help the elderly many times a day, and any other help we can offer along the way. We feel it is our job to be a friend you don’t know yet and get you safely to your destination whether you need a regular taxi or a wheelchair accessible van. At anytime at all, 24-7, if you need a parcel delivered, you can always count on us. We will pickup your parcel and deliver it to where it needs to go at regular taxi rates. This is a great service for “need it now” business that are always expanding and time is of the essence. With our fleet of 84 vehicles there is always a taxi close to your front door. Battery Boosts 19.99 hst incl. Dead Car Battery? No Problem. $19.99 will provide you a boost and usually within 10 minutes you will be on your way. Compared to a tow truck, fast and cheap is a great combination. At United Taxi, 70% of our 81 sedan taxi’s are Hybrid Electric. Not only are they environmentally friendly, they are a very nice riding car and very quiet. When you are just sitting at a light, it seems like the car is turned off. Also, when loading and unloading groceries you don’t have the exhaust smell at all as the engine is always off when sitting. At United Taxi we added wheelchair accessible vans to our fleet 20 years, that’s right, 20 years before any other company. We are very knowledgeable in driving the physically challenged and driving them where they need to go with respect and safety. We currently have 5 wheelchair accessible vans. Our vans currently work with Mobility Plus, ODSP, Waterloo Catholic School Board and the Waterloo Region Public School Board. As you can see you have built a solid reputation in the accessible van area. You may call United Taxi any time to book a taxi ahead of time for any particular time or day and have the taxi be there when you need it. Our App allows this as well with the bonus of notifications when the taxi is dispatched. We always have a special rate of $89.99, tax included from K-W to Toronto Pearson Airport no matter how many passengers up to 4 as long as your luggage can fit the taxi. Pearson Airport Pickups must be booked 24 hours in advance as well as be pre-paid upon booking. We also offer Toronto Pearson Airport pre-arranged and pre-paid pickup for $120. The extra $30 includes $15 Pearson Parking Authority’s Taxi Compound fee which is Mandatory for taxi’s to pay for picking up from out of town and $15 for one half hour (1/2) of waiting time for the taxi. If there is more of a wait after that there may be an extra charge. United Taxi works with a very large number of company accounts. Many companies send parcels to various places, shuttle employees to and from Christmas parties, or send their employees to the hospital when they are injured. There are multiple reasons why it makes sense to have a taxi account already in place for when you need a ‘no hassle’ ride. Just call us, we provide the ride then bill you at the end of every month. United Taxi also has a large number of personal accounts. Many people use these on a daily basis instead of having a second vehicle, or to drive their parents to and from where they need to go. Our drivers are always happy to assist when needed. We help with groceries or a ‘helping hand’ out to the car if need be. 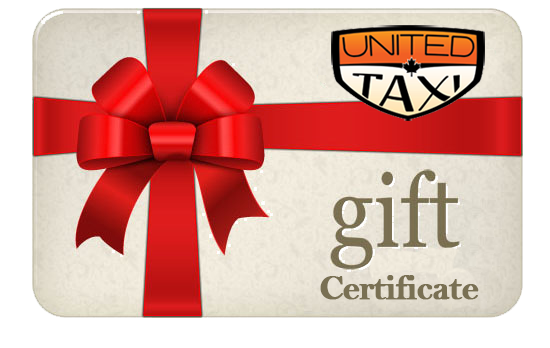 United Taxi Gift Certificates are a great gift of travel and safety. What ever your reason is, they are sure to be a hit! Dead Car Battery? No Problem. $19.99 will provide you a boost and usually within 10 minutes you will be on your way.